Tues July 29, 2008 – This morning at 11:42am, SoCal had a nice, lovely rolling earthquake. I was sitting on my couch showing my Mom how to use the Mac Powerbook that I am loaning to her when the whole room started to roll, and shake, and roll, and move. And we decided, after years of previous such experiences, that it wasn’t going to get big enough to move, so we just watched and chatted the whole time the earthquake was quaking. As it was ending, I took the Powerbook from her and typed in the USGS.gov website to see if it was reporting the size yet (hello, how fast is it in 3 seconds, silly me). Within 3 minutes the USGS site had all the pertinent details of which I twittered (although initially they reported the quake as a 5.8). Mom was very impressed. After the initial real time novelty had worn off, we looked around my living room and noticed that not a thing had fallen out of one of my many bookcases or out of my beloved china cabinet. Good earthquake proofing. Here is my secrets: Put all the heaviest books / stuff on the bottom two shelves, invert all glasses or other breakables so that the widest part of the object is on the shelf not in the air, if the bookcase is over 5 feet tall then bolt to a wall stud, and when looking for places to live choose an older place as they are better built (older wood framed one stories can live through the biggest of earthquakes). The only thing that went awry in my apartment is that one kitchen cabinet door opened a bit. 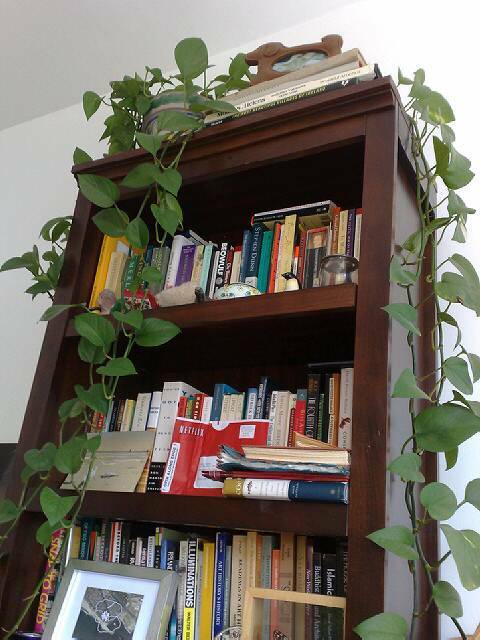 All the numerable bits of crap on the bookcases swayed but did not fall down. w00t! by Ms. Jen on Tue July 29, 2008 | Permalink | oh, california.